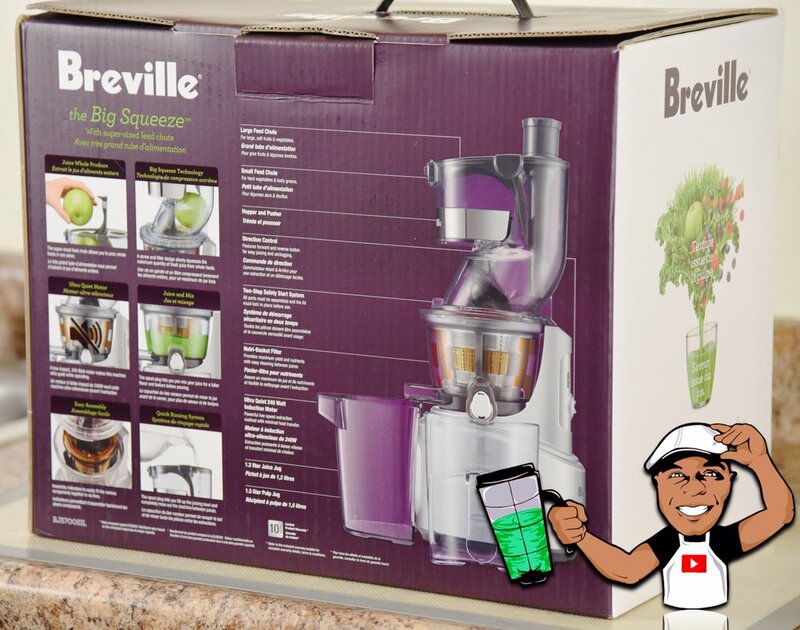 ORDER BREVILLE’S THE BIG SQUEEZE JUICER WITH FAST FREE SHIPPING HERE! SEE THE YOUTUBE VIDEO PRESENTATION HERE! 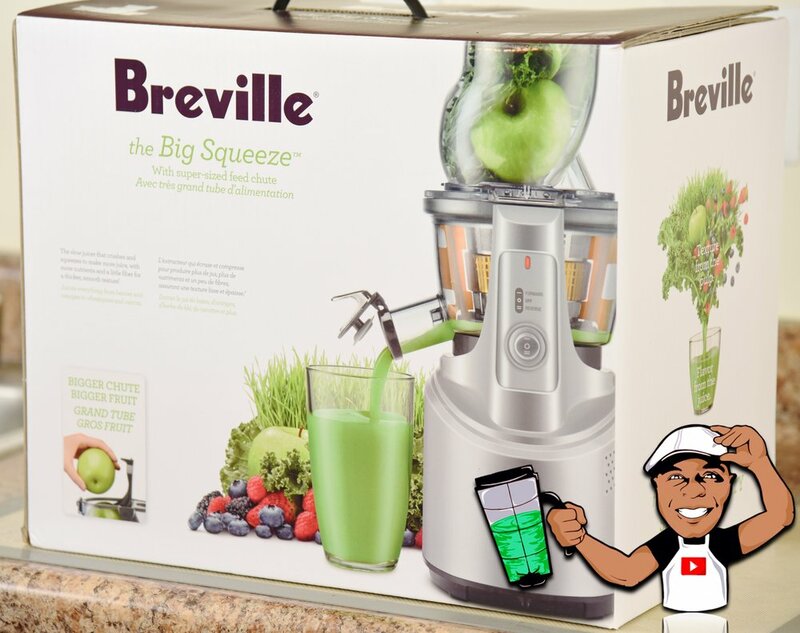 I reached out to Breville and they were kind enough to send me a review copy of their latest masticating juicer called the Big Squeeze. Juicing and blending have become the easiest ways for us to consume fruits and veggies, but you really need a dedicated juicer to achieve a proper juice. Breville’s the Big Squeeze sells for $399.99 USD and comes with a 10 year warranty. It is a vertical style slow compression juicer so it fits nicely in most kitchens as it takes up about the same amount of space as a professional blender. Now this machine is head and shoulders above the crowd, but as with any kitchen appliance it has it’s pluses and minuses and we’ll go over that shortly. 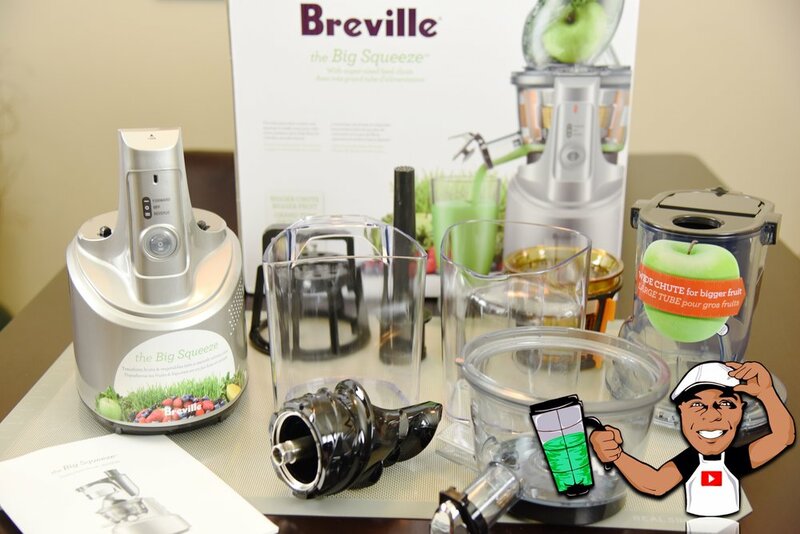 Previously I review the Breville Juice Fountain Cold which is a centrifugal juicer. 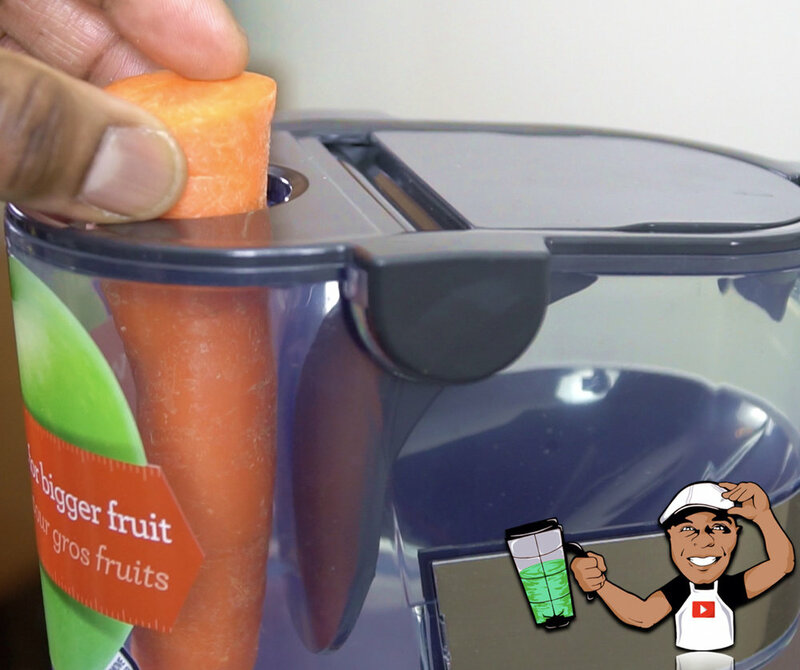 It uses a filter basket with tiny blades to cut the ingredients and mash them into a juice. Breville’s Big Squeeze uses a large turn screw (see above circled in red) mechanism called an auger that crushes ingredients turning out a larger yield and a higher quality of juice. It does this at a lower speed for much quieter operation. In the box you get everything you need to get juicing, including a scrubber brush for cleaning. I would highly recommend reading the included owner’s manual. It’s not that the Big Squeeze is complicated to use, but understanding the basics really helps you get started. One of the big benefits of the Big Squeeze is it has two openings up top. One large opening for whole apples or tomatoes, and I found it to be larger than most other vertical juicers. The smaller shoot is for your carrots, celery and the like and they get directed right to the auger to be crushed. While the Big Squeeze appears to ship with a great deal of pieces you wonder if you can easily assemble it, you can. Each of the juicing pieces has alignment guides made up of orange circles (shown above), simply align them together and they snap right in place. 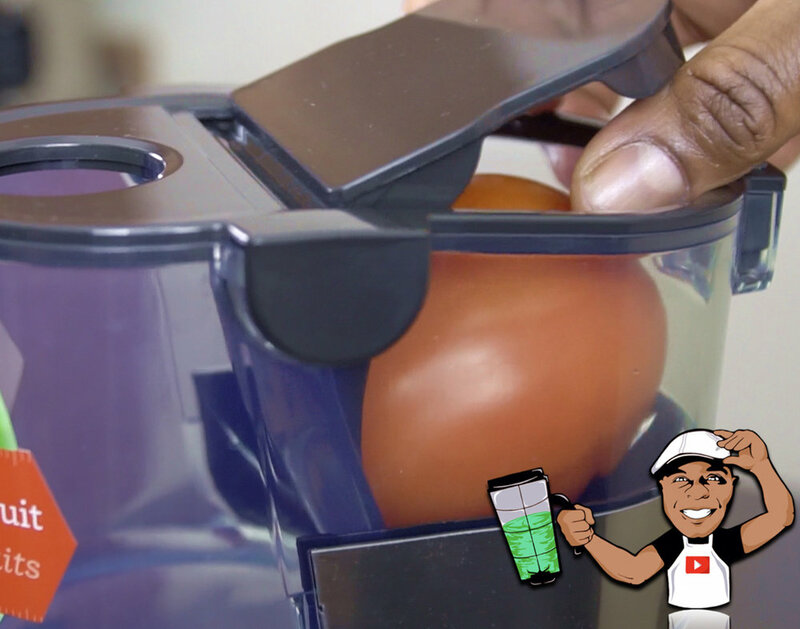 It’s about 4 simple steps assembling the Big Squeeze Juicer, see above. Then add the external containers to catch the juice and the pulp. That’s it! To put the Big Squeeze through the tests I created a whole new recipe to start off the new year. I called it the "Henry Healthy V-11 Juice”. Unlike the V8 vegetable juice, my juice is free of additional sodium, free of preservatives and free of concentrates. It’s simply 100% plant based fresh veggies and a small amount of fruit to neutralize the flavors. You can’t go wrong when you make it yourself because you know exactly what you put it in it. You can grab the recipe right here on Blending with Henry. SEARCH 🔎”V-11”. Since masticating juicers do not use blades, they rely on the auger (turn screw) to crush the ingredients. For this reason the auger may get jammed if the ingredients are not cut down to a suitable size. See above where the carrots are bulked up above the auger. If the pieces are not cut down to a suitable size the Big Squeeze Juicer will stop to protect itself. Simply press the reverse button to release the jammed carrots, then press forward again. This will cause the auger to break down the carrots to suitable size and crush them for juicing. See above as the juicing bowl is full of beet-colored juice. The Big Squeeze constantly stirs the juice during operation so you have a perfectly mixed juice of different ingredients. 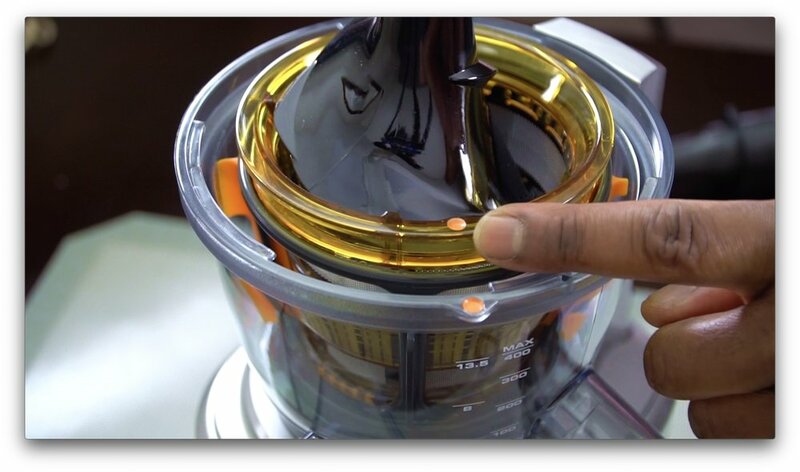 This isn’t a feature found on centrifugal juicers as they are constantly dispensing the juice as the fruits and veggies get broken down. Another benefit of a masticating juicer is the finished juiced recipe gets far less oxidation and virtually no foam as you would get from a traditional centrifugal juicer, such as Breville’s Juice Fountain Cold. See above as the pulp comes out very dry. The Big Squeeze extracts a high yield of juice. This is due to the method of crushing the ingredients rather than cutting them. 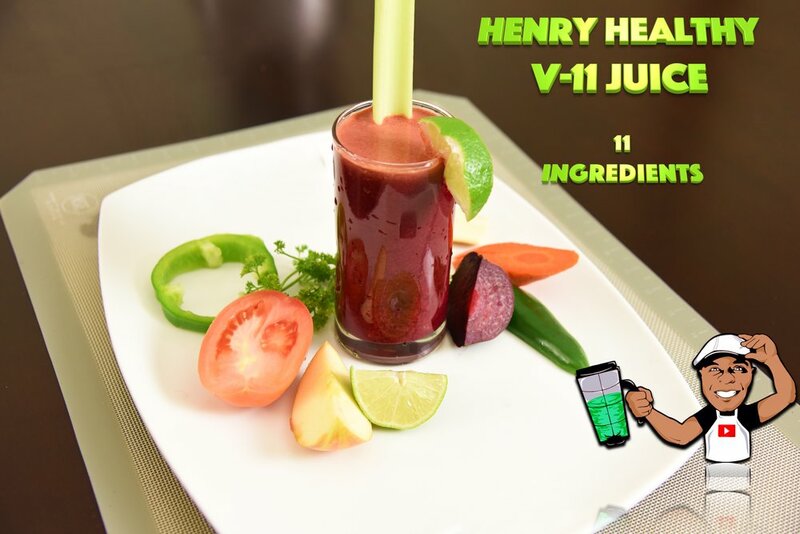 Click the video to watch me pour my Henry Healthy V-11 Juice. Notice how rich and smooth it turned out and once again, no foam. You can watch the full YouTube video presentation HERE! Some horizontal masticating juicers from brands like Omega or Kuvings have big names in the juicing world. Depending on the model, they are around the same price as Breville’s Big Squeeze. Horizontal-style juicers tend to produce a higher yield of green-leaf juices and they can also be used for grinding grains or making nut milks. Honestly, my recommendation is to purchase a dedicated machine such as a professional blender or grains mill for those specific needs, as allows for total control on the end result. Horizontal juicers are much slower than vertical-style juicers and they accept only very small amounts of ingredients at a time, so if time isn’t on your side, a horizontal masticating juicer isn’t the right product to buy. So, what are my thoughts about the all new Breville Big Squeeze Juicer? I actually love it. Not only does it look beautiful for most any style of kitchen, it’s very quiet as opposed the traditional centrifugal juicers. So if you have a family and you enjoy making fresh juice in the early mornings, it’s quiet enough where you won’t wake the most lightest sleeper. The amount of pieces it comes with may look intimidating at first but it’s easy to assemble, and you’ll have about 6 pieces that require cleaning. A small quirk (that hopefully gets updated later) in regards to the large shoot is the door latch lock is very loose and at times if my hand bumped against the latch it would easily cause the door lid to pop open. Other than that there’s not much to dislike here. While it does a good job with green leaf veggies, if your primary use for a juicer is to juice green leaf veggies and you need the highest yield of juice then you may want to look into alternatives such as a horizontal masticating juicer. For everything else Breville’s the Big Squeeze Juicer should satisfy the most demanding consumer.